Peanut butter and chocolate just go together. Can we agree on that? OK, then we can move onto how DELICIOUS this granola is! 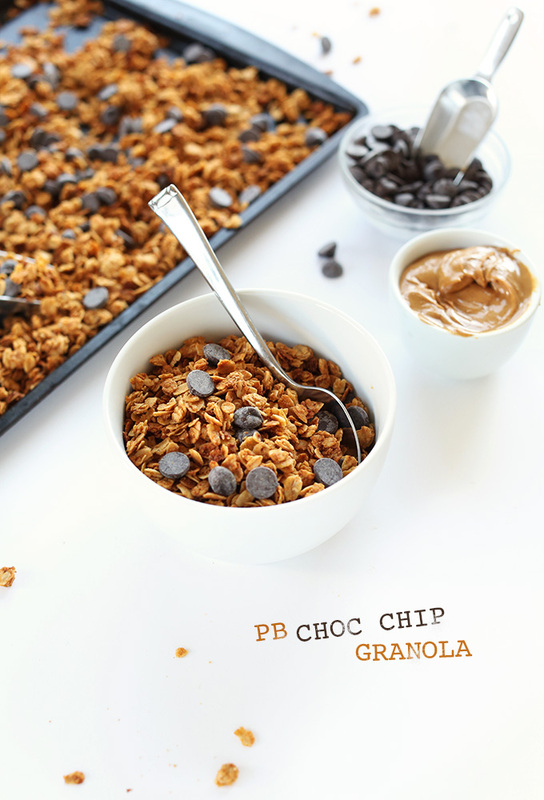 Perfectly crisp peanut buttery oats sprinkled with dairy-free chocolate chips. It’s like Christmas in the mouth. 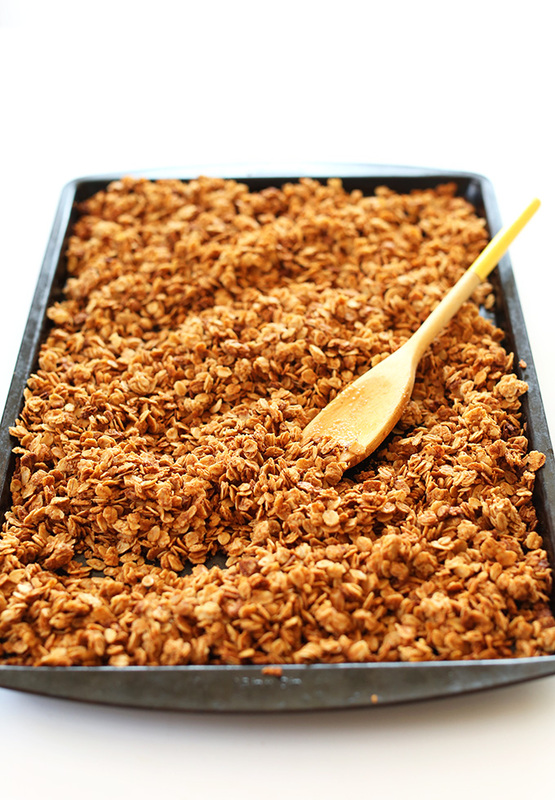 This granola is my simplest yet! Mama so proud. Just 6 ingredients and about 30 minutes required. And you likely already have all the ingredients you need on hand! Those are the best kind of recipes, no? Cool and add chocolate chips! It also makes a great gift for fellow peanut butter chocolate fiends. I gifted some of this batch to my birthday twin, Bet. I think she was pretty stoked (or she’s a really good liar). Don’t tell her but I kept half for myself. What? It was my birthday, too! 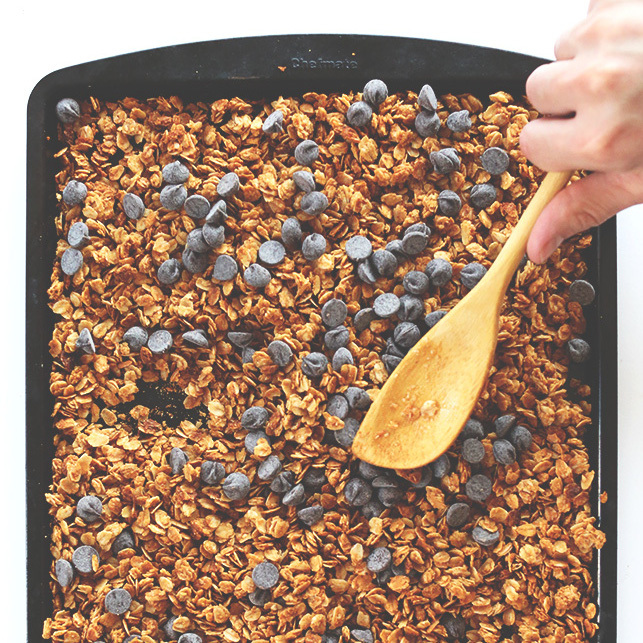 If you try this granola, let us know! Take a picture and share it on Twitter or Instagram with the hashtag #minimalistbaker. Or Pin it. (Do you follow us there? You should totally follow us there.) Fair warning though: it’ll make all your friends jealous of your breakfast eats. (But so worth it.) Cheers! 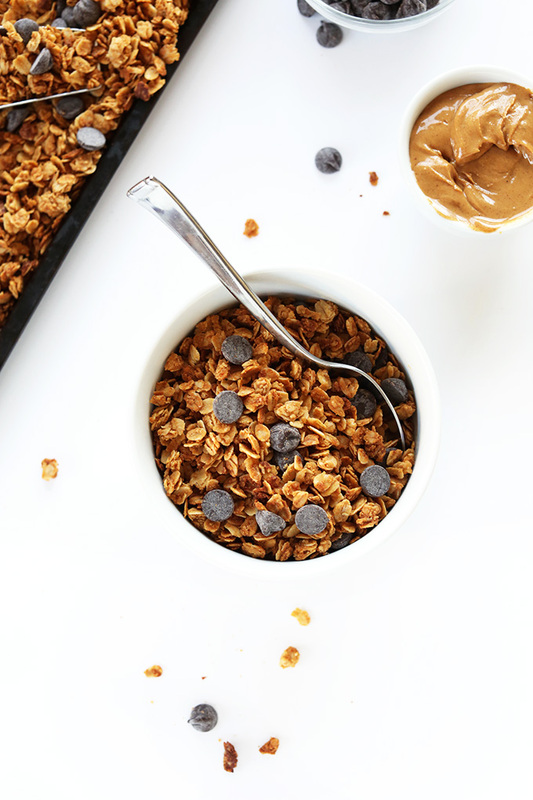 6 ingredient crispy peanut butter granola sprinkled with dark chocolate chips! Simple, fast and seriously satisfying. 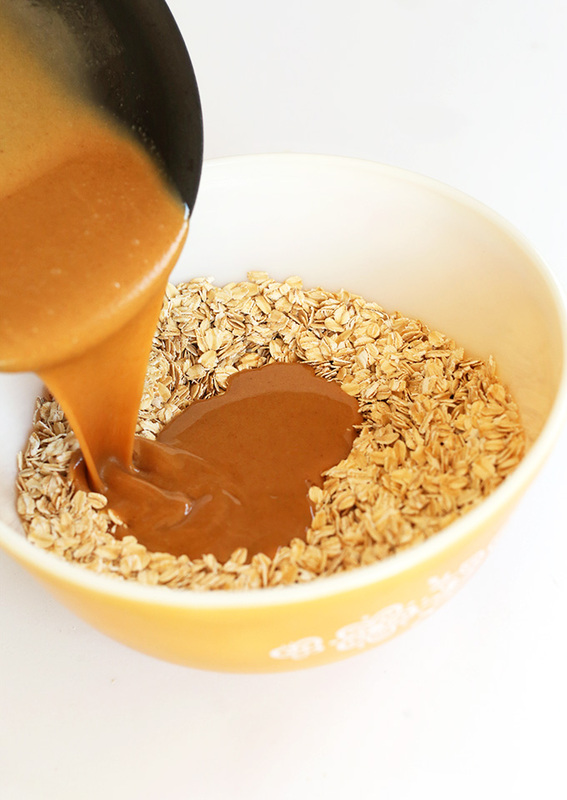 Pour over oats and quickly toss/stir to combine. If it appears too wet, add more oats (mine was just right). Spread evenly on a large baking sheet (or two small baking sheets) and bake for 18-22 minutes, or until evenly golden brown. Watch closely as it tends to brown quickly near the end. IMPORTANT: Toss once around the 15-minute mark to ensure even baking. Transfer to mixing bowl or storage container and add chocolate chips (optional) and stir or shake. Eat with almond milk - my favorite. Sliced bananas take it to the next level. Will keep fresh for up to two weeks. Freeze after that. This was my first attempt at making granola. I was surprised that after the maximum recommended cooking time, the mixture still seemed pretty wet. So, like a dupe, I cooked it longer, and it burned. once I took it out of the oven to let it cool, I was shocked at how quickly it crisped up. Live and learn. I will definitely try it again. I’m wondering if creamy peanut butter would work instead of the all natural peanut butter? Thanks! I’d love to make this granola but would like to figure out how to make it oil-free as I eat plant-based no oil. Any ideas? Lovely granola, I always thought it was tedious to make, but I had so much fun and the whole family loved it. For people who – like me – have a peanut allergy, I subbed cashew nut butter, and it came out great! Great! Thanks for sharing, Nienke! I made this last night after getting really tired of going to the one store that was within 10 miles of my house. A google search landed me here. I read the reviews and accompanying tweaks made to this recipe and headed to the nearest grocery store. I was shy the two tbsp of oats. The granola is beyond good and oh so much better than store-bought. And lots cheaper too! I love peanut butter and chocolate so much – good by the handful – or with yogurt. Hi, there! I made this on Saturday and it is YUMMY! I really like the crunch that the granulated sugar gives. I made it with coconut oil, as I have a jar of it and want to use it up. While I like the flavor overall, I think I’ll use olive oil next time; I find the coconut taste takes away from the peanut butter. However, I bet it would be superb in your Almond Joy granola, which is next on my list! I also added the chocolate while the granola was still warm, to spread it all around (great idea!). Hello! The baking time is hidden behind the ad – I’ve used this recipe for over a year now, but couldn’t remember the baking temp. If you could fix this that would be great! Thanks! I just made this, it turned out great! Here are gram measurements in case you hate doing dishes like me – just put the saucepan right on the scale and shovel everything in. I also added some salt since my peanut butter doesn’t have any. 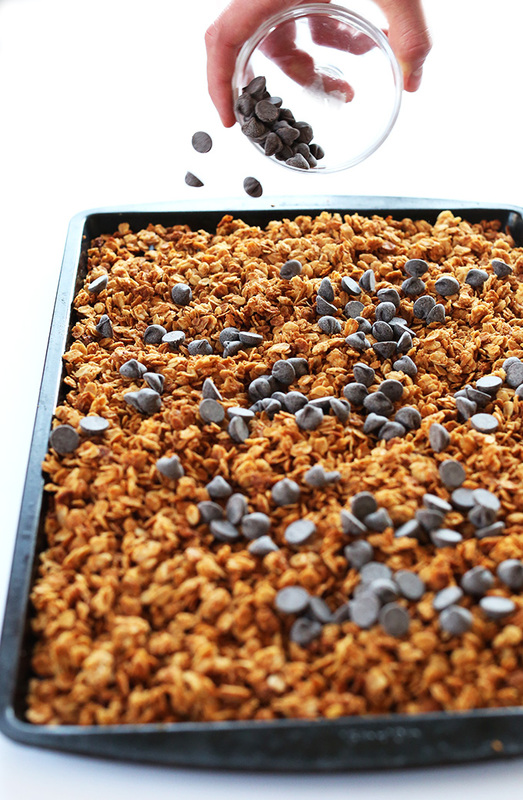 Looking forward to making this PB and choco granola! Hope you love it, Sari! Just pulled a batch out of the oven, can’t wait to taste it! I have a 2nd batch in the oven now that I added some dried cherries to. Made these for a Boy Scout backpacking trip I’m going on with my son this weekend. Hope it lasts til then…the house smells amazing! Thank you. We now make this all the time and it’s become a family favourite. We are also loving your cookbook! All the best. Wow!! This is my first try at homemade granola and my kids ate that batch in less than two days. Thank you very much! Wow, what a delicious recipe! I first made it as written, then made with my own preferences. The second time, I used canola oil and added about a 1/2 cup each of peanuts and sunflower seeds (I didn’t increase the liquid). I also left out the 2 tablespoons of cane sugar. This is great any way you make it, I’m so glad to have the recipe! Thanks for sharing too easy Peanut Butter Chocolate Chip recipe. I’ve bookmarked your recipe for make the next weekend. This sounds so good! I’m planning to make this as a Christmas present for my friends. As I’ll see most of them this weekend for the last time before the holidays, I wanted to make the granola some time this week. Do you have any suggestion on how to make it stay crisp for as long as possible? I considered freezing it at first, but then I wasn’t sure if it’ll turn soggy after defrosting. Will an airtight container do? Thanks so much! Ni Nadine! To keep it crispy make sure to bake it til golden brown then let cool completely. Store at room temp in a sealed container up to 1 week. OR, in the freezer! Amazing!! My kids and I love it! I’m going to give it away for Christmas presents too! I’m a homeschooling mom of 6, I also work 3rd shift. Everyone loves this recipe! We use it for cereal on my homemade yogurt and when it’s fresh from the oven they pick out the bigger chunks.? Love the simplicity! I make 4 batches about once a week and you better believe it goes fast. They’re not shy about reminding me to make more, either.? So thanks for the great recipe! Peanut butter & chocolate – the best combo! Can’t wait to give this a try! Hi Dana!! :D I’m about to make this deliciousness, I was just wondering, since it’s August and hot hot hot, can I store it in the fridge? Not freezer, just the refrigerator? Would that make it last longer? Thank you! 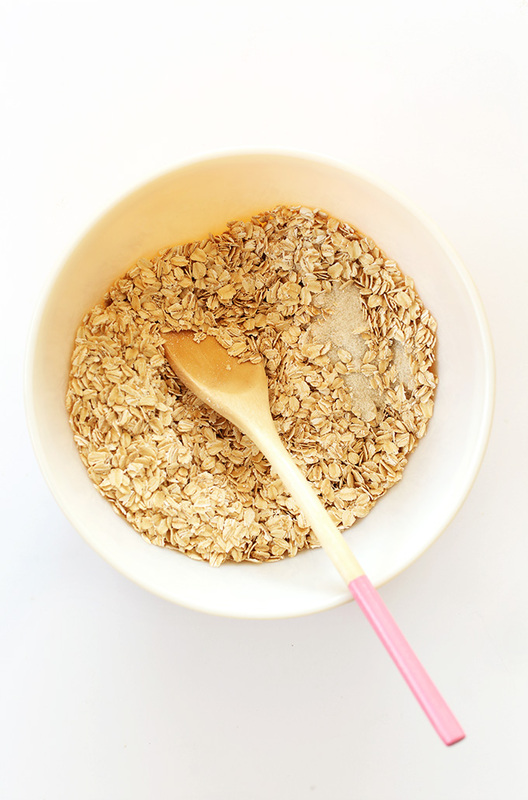 Can I use golden syrup instead for all of your granola recipes? Or will that make it too sweet? I have a lot in the pantry and want to use it up. Hi Aimee! I’m not sure what golden syrup is! But give it a shot if you’d like and let me know how it goes! Made this today. It is the first time I have tried to make granola! It browned a little too much on the edges when I moved it to the lower rack, so I guess it must be kept in the middle rack to avoid burning or over browning. It still tastes delicious. I added the chocolate nibs 10 minutes after letting cool it cool down, so they could melt a bit as recommended by one of your readers. I am so happy to have found this recipe, and your brownie recipe, to! 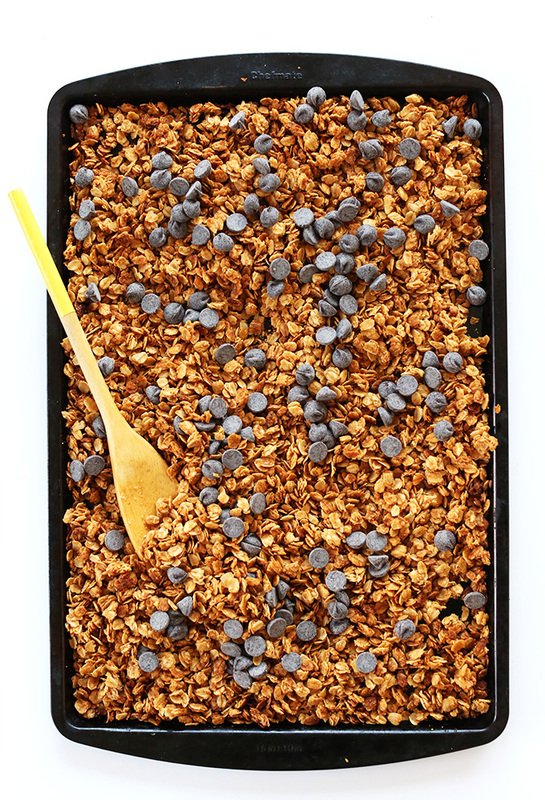 My boys loved this granola recipe as much as they love your brownie recipe, Thank you so much for simplifying our lives! I was searching for granola recipes to make on the weekend, but this sounded SO amazing, and I had the ingredients at hand, so it’s in the oven right now! Great recipe – thanks all the way from Denmark! This looks great, making it tonight! How would you recommend making this recipe into chewy yumtastic bars? I have some coming up soon, actually! But you could use this as a guide – just sub PB for the AB. I love this recipe. I leave out the chocolate and add a teaspoon of cinnamon, about 1/2 cup dessicated coconut and roughly a cup of mixed nuts, dried fruit and seeds – just whatever I have left in the cupboard. Bake for 12 mins at 170 degrees in my electric fan then another 5 mins with all the extras so they don’t burn but toast slightly and the fruit plumps up. Lasts about two weeks for one person and I use it as a base for overnight oats, with almond milk, with yoghurt and fresh fruit or sometimes on its own ?. I’ll admit to having it for breakfast, lunch and dinner on occasion. Thanks again for another fantastic recipe. Have shared your blog with lots of friends and this recipe in particular. I made it but I didn’t get the same type of crunchy clusters I did when I made the Nut and Honey Coconut Granola. is it meant to be clusters or just crisp and loose? Not sure if it was the 100% natural peanut butter as I added about 5-7mins extra leaving it in the oven to get golden brown colour. Its till soo yummy though! Can’t wait to have with Almond Milk for Brekkie. Toasting in my oven right now! I kept out the sugar, and added sliced almonds. I can’t wait for it to cool!! Can you omit the oil or does that provide an important element? I think you need it – it helps it brown and crisp up. Made this twice. It is so good!! Served in a parfait with banana yogurt, and coconut whipped cream. Sooo good!! Thank you for this keeper! Hi there! Do you think I could replace peanut butter with cookie butter instead? Is that going to work as well? Thanks in advance ! I tried your recipe because I’m seriously CRAZY about peanut butter it was good but the taste of peanut butter was not enough strong for me but next time I put more or I’ll buy an organic version I don’t know if that makes a difference what do you think? Kiss from France! This is going to save my protein intake at breakfast! I normally have homemade granola with lots of nuts but just found out I can’t tolerate them whole – only as nut butters and flours. Sad news, but feeling better about breakfast with this recipe in my arsenal. Thank you! This is by far our absolute favorite granola recipe. I make a couple of batches of different granolas every couple of weeks (homemade granola is the only breakfast cereal we eat, I know exactly what goes into it). This one is always the one that goes the fastest, and the one I always make the most of. I have a triple batch in the oven right now, and will probably make another triple batch as soon as that one is done. This one is also the simplest one to make, which I greatly appreciate! It is so yummy! Thank you for the wonderful recipes! We make a batch of this every two weeks–that’s not to say that a batch LASTS for two weeks, but we only allow ourselves to have it that often! I use honey to sweeten with only a small splash of pure maple syrup. I also omit the chocolate chips and add in chopped pecans, sliced almonds, and flax meal. 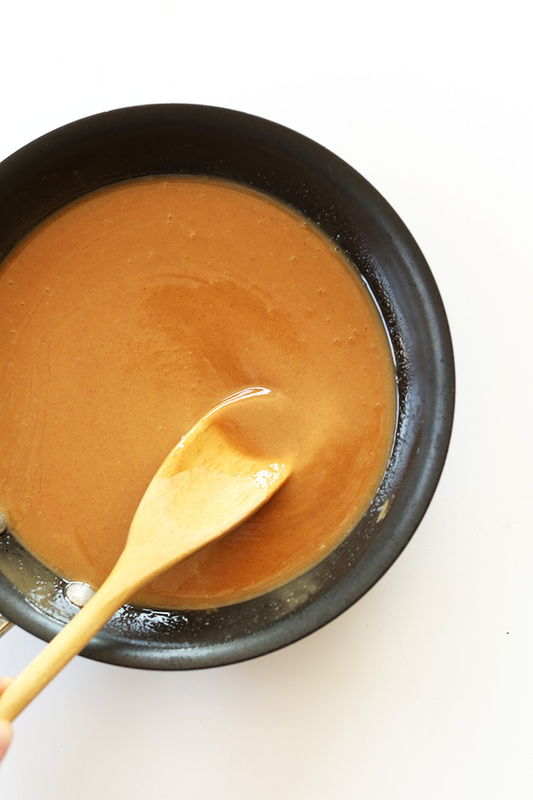 This time I used half creamy, half chunky peanut butter and was so, so good! Thank you so much for all of your recipes! You are not only helping us to have a smoother transition to a vegetarian life (with 3 adventurous but vocal kiddos! ), but have also made a believer out of my parents, who were skeptical to put it mildly, about the idea of drastically cutting out the amount of animal products they consumed. Thank you again! I’d like to know what kinds of main-dish meals you would take to a potluck? We have potluck at our fellowship twice a week and since we switched our diet I have been bringing veggie lasagna and EVOO baked potatoes. It’s getting old. I also have one soup recipe that even kids love. Everything else that I make at home are not potluck friendly. Thanks so much for the easy and great recipe, I’m thrilled to have discovered your site! I swapped in yellow raisins for chocolate chips and added about 1/4 cup of chia seeds, sunflower seeds and sesame seeds. Also baked at 325, because the first time I made (at 340) the granola burned. Totally delicious and perfect for holiday gift giving. I decided to double the coconut oil and peanut butter (1/2 cup of each), and it turned out soooo delicious. Thank you for the recipe!! Fantastic! Amazing how something so simple could be so good. When I made your pumpkin maple granola, it was still pretty wet and I had to put it in the dehydrator for a while. This was perfect. I turned the oven up to 350, cooked it for 21 minutes, and probably most importantly—did not use a silicone liner. A silly question: why 3 cups plus 2 Tablespoons of oats? I’ve seen that in other people’s recipes. Why not just 3 cups? Or 3 1/2 cups? Inquiring minds want to know? I’ve always made my own granola but thought it was a lot of work for minimal rewards—never tasted that great and used lots of ingredients and was time-consuming. Yours is just the reverse: minimal ingredients and time, maximum flavor. I can’t thank you enough for getting me out of the snobby perception that a recipe has to have lots of ingredients to be good. If they are the right ingredients, masterfully chosen and executed (as you do so well, and then you write it up and photograph it so beautifully), the food tastes terrific—and it frees us up to make something else with the time we saved (in my case, it was raw chocolate balls—cocoa, coconut oil, dried coconut, vanilla, maple syrup, and chia seeds). It’s just my mad scientist ways, I suppose! Glad you enjoyed this recipe! Your granola recipes are by far my fav! And this one definitely gave me that choco fix I needed for the day! I used vegan chips and it Sort of reminds me of a really healthy crunchy peanut butter cup. In the oven now! I LOVE all of your recipes! I was vegetarian but due to breastfeeding I can’t have dairy or soy as my son is intolerant. Your recipes have helped so much! My sister experienced that during breast feeding as well! Glad we could be a resource! Question, could you use quick oats instead or is that the same thing as rolled oats?? Also do you think you can come up with a yummy creamy peanut butter chocolate vegan pie??? Please email me if you do I would LOVE to try it. I have that! Find the recipe here. As for the granola I really suggest rolled oats, but am sure quick cooking would be ok in a pinch. This granola is amazing! My husband called it the best granola he has ever eaten. I used pure maple syrup, mini chocolate chips & coconut oil. Next batch I will omit the sugar because I like just a touch of sweetness & the maple syrup should provide enough. I want to make this as Christmas presents this year, roughly what size jar do you think I’d need, I can get 2l ones or 1l, I have no idea! Making this and a chai concentrate to give to people. I would use pint jars to give as gifts. I’m baking a batch as I type this. Smells delightful. I just halved the recipe and it turned out great! I haven’t even added the chocolate yet and I can’t stop nibbling off the pan. Thanks for such an easy recipe! Whoop! Glad you liked it, Leah! Just tried it out and it is really good! I just made this with homemade almond butter. It is fabulous – simple, but decadent! I bet it would also be good with raisins instead of chocolate chips. PB & chocolate are BFFs for life! 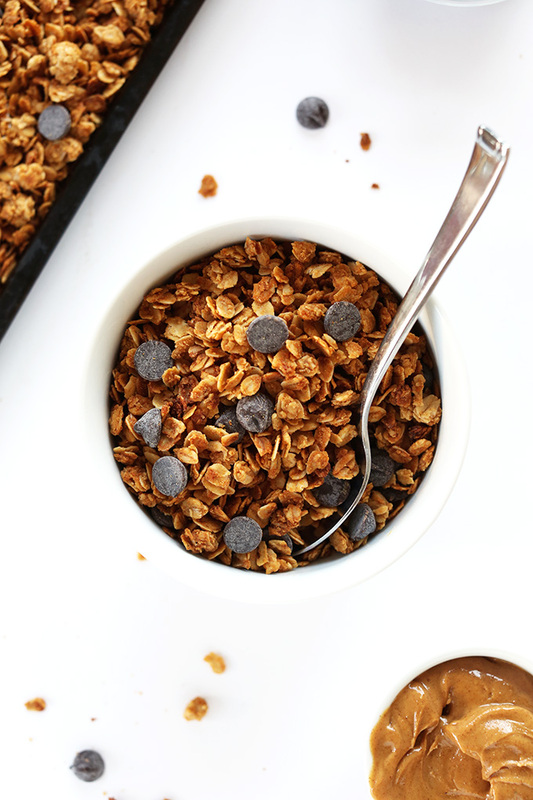 Love this simple and delicious granola. Pinned. This looks yummy! I buy my little man organic peanut butter chocolate chip granola bars, so I know he will like this granola, too. Oh this sounds so yummy! I love cooking oatbran with dark chocolate soy milk and then adding a spoonful of crunchy peanut butter at the end. I’m always looking for more peanut butter recipes so thanks for this!! I JUST made your Banana Bread Granola yesterday, and since that is already almost gone (so freaking good!) I’m tempted to run to my kitchen and make this right this second! Yumm–I LOVE having a little chocolate with breakfast ;) starts the day off right. I’ve been meaning to make my own granola, so I’ll have to try this, and I’ll let you know when I do! Ooh, smart! Thanks for the tip! Totally doing that next time! PB and Chocolate Granola! Exactly what my dreams are made of. This looks so yummy, can’t wait to make it! I love that you make everything seem so doable :) This looks great!! I have to try this!! it looks so yummy that its making me hungry just looking at the pictures! Oh my goodness, yes, yum! I’d like to use almond butter. Do you think that would work? Was your pb sugar free or natural? Try these and sub PB! I just Love Your Stuff Guys — have tried a few – have had Great Success with ‘Best Damn Vegan Biscuits – they turned out perfect 2 times already – will try this one too. Grateful for all your testing – you guys are the Best! Thanks Janet! Glad you enjoy the recipes! Love granola, love PB, will definietely try this! Thank you for sharing. I wonder – will it work with crunchy penut butter or not necessarily so? Definitely! Creamy will coat the oats better but crunchy will work fine. Hope that helps! You sure do know how to do it right. 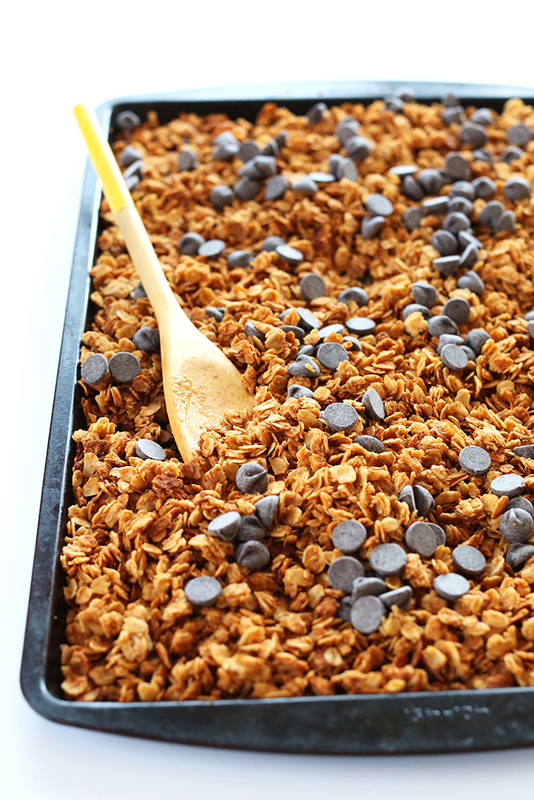 Peanut butter granola with chocolate chips. I am loosing my mind over here. This looks so great! 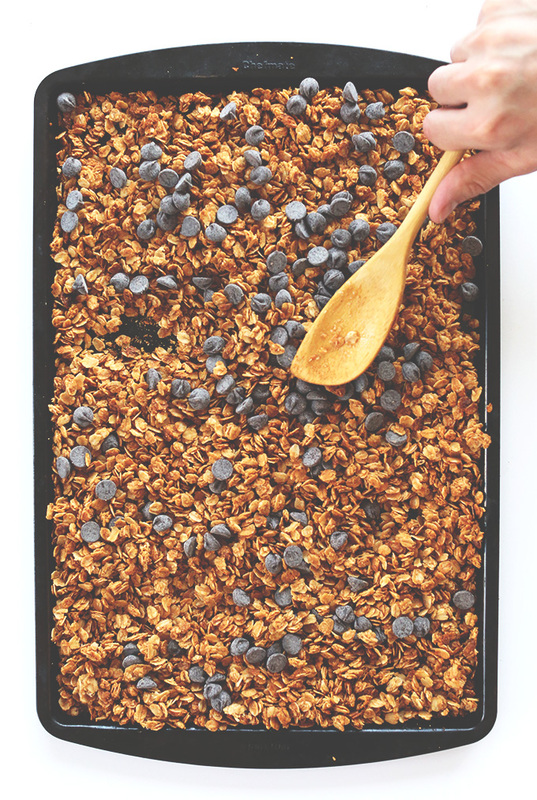 I’ve never had much luck with granola, but I need to give this a try! Simple and quick… SOLD! I’ll be knocking up a batch this weekend! Mmm…it would definitely make me get out of bed more quickly if a breakfast like this were waiting for me! I’ve never tried peanut butter granola before, but it sounds fantastic – looking forward to trying it! IT’S THE BEST. Seriously my new fave! Hope you give it a go! Simple + peanut butter = I am so in! Will have to play with this recipe. I make my granola in a crock pot. Still have to keep an eye on it and stir every half hour or so, but I am a klutz and make less of a mess than trying to stir granola in a low sided pan. Hi i have made this granola a few times and it was a HUGE hit at my house (five kids) best part about it? IT COULD NOT BE ANY MORE SIMPLE! Thank you!! I would love to try this in a crock pot! Anyway you could share your crockpot recipe ? Thank you. I love this dessert granola!! Holy yum! Ohh this looks so delicious!! Need to make this ASAP. This looks fabulous, and HAPPY BIRTHDAY!